Let me tell you a little bit about it. For starters, it’s an e-cookbook. It has been published by a wonderful new digital publishing house called Hang Time Press (you may recall my interview with Lori from Hang Time a few months back). Their niche is primarily mini e-cookbooks, although they will also be publishing some full length e-books starting in 2013. I first met Lori through her lovely blog, Wine Country Cook and was thrilled when we decided to work together on this project. You can check out the other mini e-cookbooks they have published here and in their spring catalogue. 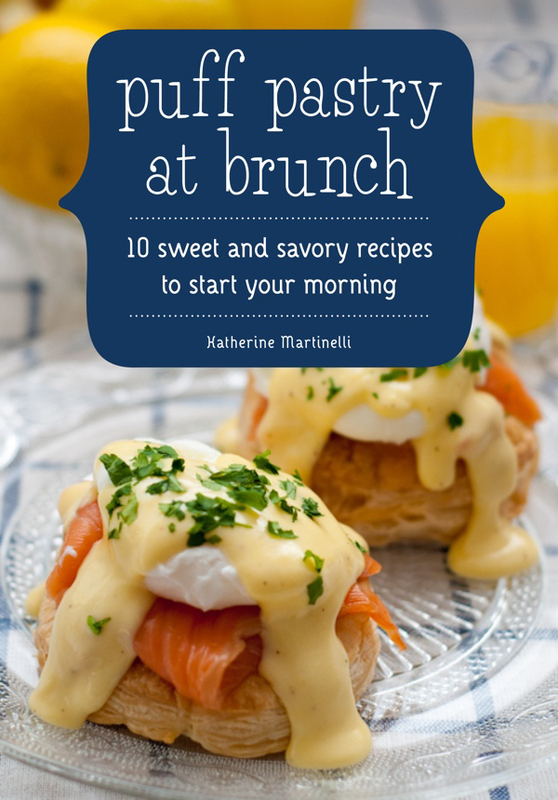 In case you couldn’t tell from the title, the cookbook has 10 recipes, all of which use frozen, packaged puff pastry as the basis for inspiring brunch recipes. Ten recipes may not sound like a lot, but the book is 52 pages of my photography, recipes, and tips on working with puff pastry. I like to think that each recipe is really just a springboard for other recipes, and I offer a lot of ideas on how you can alter and adapt each one. Plus, I’m not joking when I say I poured my heart and soul into these 10 recipes. With the exception of one, they are all new and never before published here or anywhere. Each recipe is my own creation, tested again and again until they were just perfect. Yes, I’m quite proud of this little book. The butterflies in my stomach are dancing, and my heart is all aflutter. I’m excited to finally be able to share this with you. Here’s where you come in: Please buy my book! It’s only $2.99. That’s the price of a coffee at Starbucks. Just about 11 shekels for my Israeli friends. It’s available at the Amazon Kindle store, and for Barnes and Noble’s Nook. Soon it will be out on iTunes. You can check out all the options here. Don’t have an iPad or e-reader? No problem! Download Kindle for Mac here and PC here to read it on your computer. And, of course, I’d be thrilled, honored, and through the moon if you share it with your friends and readers, family and strangers on the street. If you like it, a review on Amazon or elsewhere would be incredible. A note if you are kosher or vegetarian: There are two recipes that call for bacon/prosciutto and one that features salmon, but I offer delicious vegetarian substitutions for each so please don’t let that deter you! Seriously, the baked egg cups are just as special without prosciutto, and no one would notice bacon missing from the quiche. I am sorry to my vegan friends, though, as puff pastry is, by its very nature, very not vegan. Thanks to all my readers for being my supporters and cheerleaders, and allowing me to be a part of this fabulous community of food blogging. So exciting, Katherine, congratulations! This mini e-cookbook format is a really cool idea. As for vegan (and parve) puff pastry, apparently Pepperidge Farm’s puff pastry sheets are vegan! Congratulations!!!! How did you ever keep it in this long? 🙂 Off to check it out! Yipppeeee!!!!!! Katherine, this takes my breath away and I knew it was happening. You are so fabulous. Aww Lori you are too sweet!!! You’re the best. Thanks for being such a great supporter. Congratulations, Katherine! Can’t wait to get it! Off to amazon right now to order. I am so happy for you, and also incredibly jealous! Heading off to order it right now! Puff pastry features heavily in our house. Thanks so much Mirj!! I wish it was available in pdf for you! Will buy this for sure! what an awesome accomplishment! You have all the right to be dancing on top of the world for years and years now! Aw thank you so much Sally!!! Oh my goodness, this is so exciting! Can’t wait to check it out! 🙂 Many congrats to you! Thank you thank you Cassie!!!! I hope you enjoy the book! Wow! Big, big congrats! E-publishing is the future (and already the present), IMO. The real value publishers add to most authors is the marketing and distribution. And these days they’re doing little marketing (except for their “A” list books), and with Amazon and Barnes & Noble selling so many books, distribution isn’t as challenging as it used to be (and with E-Books the distribution problem is relatively minor). I used to work in publishing – primarily college and professional books. And although I’ve never done cookbooks, my office used to be next to the editor that published the CIA cookbooks – who of course became my best friend so I could get free cookbooks! Anyway, the whole business is changing, and IMO we’ll be seeing a lot of author-driven E-Books in the future. Caveat is the cookbook market still seems to be a pretty strong print and paper market – even I, who love E-Books, still like to work from a physical cookbook, so we’ll see what happens. Anyway, great, great news. You’re an excellent writer and photographer, so I’m sure the book is great. Thank you!! I agree, it’s all changing. This e-cookbook is sort of an experiment with this kind of stuff. Luckily I have a publisher behind me who is doing a good part of the marketing, which is a huge plus over say self-publishing. I also love both e-books and physical books, especially cookbooks. Congratulations Katherine! This is wonderful, I’m very happy for you! Can’t wait to see your amazing work! Thank you so much Luciana!! Congratulations on your first cookbook enterprise. I think its wonderful that you had the motivation and focus to do it- including all the recipe and photographs yourself. It will be a spring board for many cookbooks to come. Mazel tov, Katherine! What happy news – I can’t wait to check your book out. Knowing your recipes and photos, it’s sure to be a delight. I’m thrilled for you! Aw thank you Hannah!! That means a lot to me! Congratulations! It looks like I’ll have to get the puff pastry out of my freezer and get to work. I love the idea of focusing on one main ingredient. Thank you!! I love puff pastry, it is so versatile. Wonderful news Katherine! Congratulations and well deserved! How very exciting. I would be over the moon too. This is a fantastic development you enjoy it!! Congratulations! This is so exciting. The cover looks fantastic and e-book is the way to go. Thank you Biren!! Yes, we’ll see how the e-cookbook format does! Congratulations! Bravissima going to check it out! WOOHOOOOOOOO! Congratulations Katherine!!! Can’t wait to get my hands on it. Congrats!! It must be an awesome feeling! Katherine, I’m really excited for you, and congratulations on this big achievement! Hooray! You must be so happy to see it’s actually finished and in the official Amazon Kindle and B&N site now. =) Yay!!!! Thank you Nami!!! It is great to finally see it on the iPad. Mazal Tov – may it sell and sell and sell and…. What a fun concept for a cookbook! I’m SO excited for you and I will for sure be checking it out! Thanks Joanne! I had so much fun doing it, so I hope you enjoy! Congratulations! It’s a great idea for a cookbook. Congratulations! I have ideas for TWO at this point, which, if things keep going like this, will never materialize… LOL I LOVE puff pastry!!! Good for you. On another note, I’ve given you a “Liebster Blog” award, b/c you’re so awesome (flattery, I know, but well deserved). Thank you so much, both for the congrats, and for the award! *bats eyelashes* I can imagine any cookbook you would put together would be amazing Sofie, I really hope you go for it! Clicked on the link for the Nook version but it directed me to the Amazon Kindle version instead. I’ll search on the B&N site for it. Very exciting indeed, it sounds like a very delicious book and that photo is gorgeous! Congratulations! Congratulations! This is big news. So happy and excited for you. Will have to get my hands on the book as soon as possible. All the best Katherine. Well done!!! Thank you Asmita! I hope you get it and enjoy it. Let me know! This is big news! I am sure you are so excited about this, heck I am even excited for you. There is so much untapped talent in the food blogging world and I am glad to see that you got published-congrats. The book looks amazing! This is the just the beginning of more awesome things to come your way, so enjoy it. Congrats on the super big new Katherine!! Thank you so much! I really appreciate your support, and hope you enjoy the book! 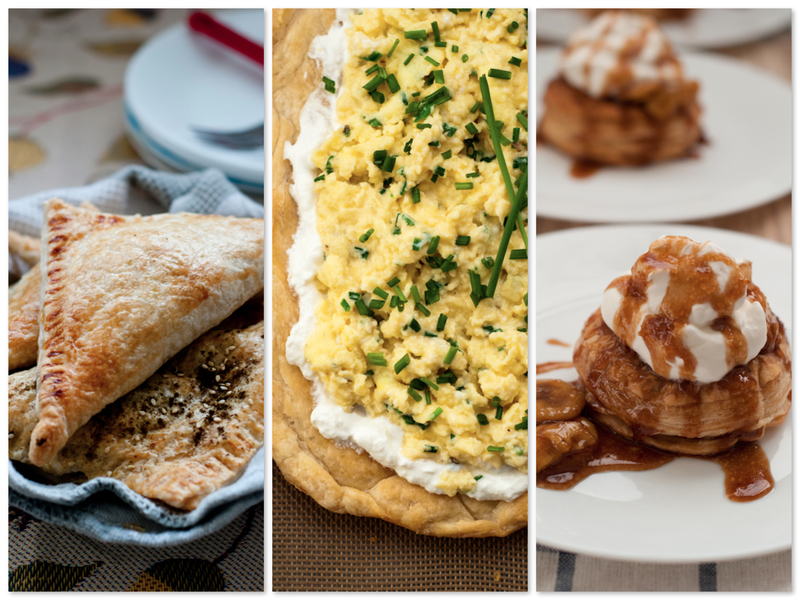 Sounds like you love puff pastry and brunch as much as I do! Such amazing news after my short hiatus — congratulations honey, so proud of you!!!! Congratulations Katherine! That’s wonderful news! I was planning on doing some Amazon shopping tonight, I’ll be sure to add your book to the cart as well! I’m definitely coming in late on this one, but I guess – better late than never. 🙂 CONGRATULATIONS! This is so, so AWESOME! Yes, I can see why you are jumping up and down with excitement! What I can see from this post I can see that it’s a beautiful book with 10 awesome recipes. Since I’ve never ever worked with or cooked with puff pastry, it’s definitely an educational cookbook for me. Thanks! Oh thank you so much MJ!! You will love working with puff pastry, I just know it. Frozen puff pastry defrosts fairly quickly and has endless uses. I really adore it. 52 pages for 10 recipes makes this book totally worth it, and I think it’s obvious that you put a lot of work into those recipes! Congratulations! This is HUGE! Jeff, thank you so much! Really, it means a lot to me. Thanks!! Congratulations!! 🙂 That’s amazing, and I love the pictures – looks like a tasty investment! Thank you so much Kiri!! Wow, really exciting stuff! Congratulations. The things I miss when I am working! Congratulations, it already looks amazing just from the pictures here! Haha silly work :-p Thanks so much Jo! How exciting Katherine! Congratulations to your publication. puff pastries for brunch sounds like a solution to my brunch time cravings! Thank you so much Helene!! It has definitely been satiating my brunch cravings! Aww thanks Terra! You make me smile. These recipes actually all use convenient packaged puff pastry, so you don’t even need to touch your bucket list for this! Of course, homemade puff pastry would work too! Thanks so much. Hugs! Congratulations, Katherine!!! How wonderful =)) … I hope you don’t mind, I nominated you for the Versatile Blogger Award 😉 You can read more about it on my blog and I’m looking forward to your response =)) Enjoy the rest of your weekend !!! Aww thank you so much Tess!!!! And what an honor. Thanks for the award! How exciting for you – and for all of us! Congrats! That is great! Just ordered it on the Kindle store and pinned it under “books worth reading”. Congrats! Oh Susie thank you SO much!!! You’re the best! Congrats Katherine! So well deserved. So excited for you!!! Awesome! The front cover photo looks amazing! YUM! Congratulations Katherine! If those sample pictures are any indication of what else is inside the cookbook, I may have to scoop a copy up for myself! Thank you so much Kelsey!! I hope you do, and I hope you enjoy it!! Congratulations Katherine! I’m so excited for you 🙂 … I need to get me a copy of this! Thank you Ann!!!!! I would be so happy if you got a copy and even happier if you like it 🙂 Thanks so much for your encouragement! How exciting!!! The photos look awesome! Can you give up a hint of the recipes inside?? Thank you Mary!! Absolutely. Let’s see, there’s the puff pastry galette with creme fraiche, creme fraiche scrambled eggs, and chives. There’s strawberry-rhubarb and cream cheese pastries. Spinach and feta turnovers/burekas. Baked puff pastry egg cups with bacon and cheddar. Oooh and simply divine caramelized banana stacks with whipped cream – so good! You can also go to Amazon and “preview” it for the full table of contents 🙂 Also I published the full spinach and feta turnovers recipe at a guest post over at Just One Cookbook on Wednesday, so you can head over there to check it out. Congratulations Katherine!! This is BIG news and I am so happy for you 🙂 Will wait for the book to show up on itunes! !